Prime Minister,Narendra Modi interacted with students from all over the world to discuss some serious issues like the stress of good scores,depression in students,how to score well in exams,managing life away from home and role of parents and teachers in a child’s life. 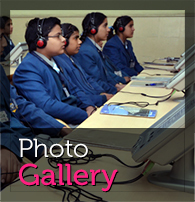 CT Public School made arrangements in the audio visual lab of the school to present the prime minister’s speech to the students so that they could find ways to cut off depression from their lives.Parents and teachers were advised to communicate with children to fight against depression.Emphasis was laid on regular conversation with children as well as their routine counselling. The children were told not to compare themselves to others and never to do anything under pressure.A child should always be clear in his thoughts.Parents and teachers shold always appreciate the efforts of the students. The school should conduct exams as they are never bad but the aim should be acquiring knowledge and not marks. The school authorities highly acknowledged the Pariksha Pe Charcha interactive session of PM with the children and promised to focus on stress free examinations. The Principal of school,Mr.Daljeet Singh suggested the teachers,students and parents to take care in improving the education system of the country and never force the children to fulfill their parents unfulfilled dreams.The vice principal ,Ms.Sukhdeep kaur motivated the students to act upon the PM’s advice and mark a difference in their lives.